Great Urban Race Challenge – I taught the participants karate! | FITAPPY Fitness & Healthy Plan to Change your Life! Great Urban Race Challenge – I taught the participants karate! Great Urban Race visited out karate this weekend! This race is a wild urban adventure. Teams solve twelve clues and complete exciting mental and physical challenges while discovering the city in a particular way One of the challenges was to come in to our karate dojo and learn A) 6 techniques fighting combination and B) do knuckle push ups on cinder blocks! I was involved in the first part and taught the participants how to execute that combination. It consisted of a front snap kick, left jab to face, right punch to stomach, roundhouse kick, spinning back kick and a reverse punch! I had only 5 minutes to complete a short warm up and teach the combination! Crazy but it was fun!! Sounds easy but doing it over and over for hours….. drained me! Couldn’t imagine a better workout!! It wasn’t just me teaching all the time – we rotated but I’ve done it many, many times throughout the afternoon. I enjoyed it a lot because all the people coming in were full of energy and fun! Most of them had awesome costumes. 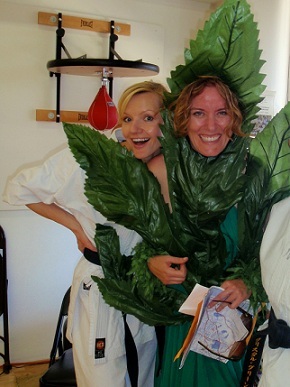 Here is a picture with one of the participants dressed as a Marijuana leaf 🙂 Hilarious idea! This entry was posted in General and tagged jab, kicks, Los Angeles, punch, spinning kick, weight loss, weights, workout. Bookmark the permalink.